Truffles. Mmm, the very word conjures up thoughts of rich dark chocolate covering a whipped smooth ganache centre that melts on the tongue, creating ripples of delight causing you to close your eyes and greedily lick your lips in expectant pleasure. It’s rather disconcerting then to discover that truffles get their name from their similarity in appearance to a dark knobbly fungus that grows underground! The best – and most expensive – truffles are made with the finest ingredients, and require the skill of a chocolatier to create. We’re not trying to compete with that but we do have recipes for very simple and delicious truffles that you can make at home. Melt the butter while you mix together the cake crumbs, drinking chocolate, caster sugar and almonds. Stir the butter into the mix and make a paste. Roll into truffle-sized balls. Put the extra drinking chocolate in a plastic bag and toss the truffles in it until completely coated. Place in individual sweet paper cases. Sieve the icing sugar. Place the biscuits in a bag and bash until in small crumbs. Push the crumbs through a sieve into the icing sugar. Break up the chocolate and place in a bowl with the butter. Put the bowl over a pan of hot water. Don’t let the bottom of the bowl touch the water. Leave to melt, stirring occasionally. Remove the bowl from the pan and stir in the sieved icing sugar and biscuit crumbs. Add the egg yolk and beat well. Add rum. Leave to stand, covered, for 10 minutes. Roll into truffle-sized balls and then roll in the vermicelli until coated. Place in sweet paper cases. Break the chocolate into a bowl and put with the butter to melt over a pan of hot water. Don’t let the bottom of the bowl touch the water. Remove from heat. Stir in the cream and egg yolks and beat to form a paste. Roll into balls. 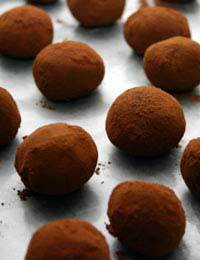 Put some cocoa in a small plastic bag and toss the truffles until completely coated. Place in sweet paper cases. Place the dark chocolate in a bowl over a pan of hot water. Do not let the bottom of the bowl touch the water! Leave to melt. Meanwhile bring the cream just to the boil, taking care not to overheat. Remove the cream from the heat and pour in the melted chocolate. Stir to combine. While you’re doing that put the butter to melt and then add it to the chocolate and cream. Whisk until you have a paste you can roll into small balls. Melt the milk or white chocolate (in a bowl as above). Roll the balls in the melted chocolate to coat and then sprinkle generously with cocoa. When set, place in sweet paper cases. The better the quality of your ingredients, the better your truffles will be. Roll your truffles in cocoa, vermicelli, grated chocolate, or finely chopped nuts. Before you start, cover a chopping board with clingfilm. When you’ve rolled and coated your truffles, place them on the covered board to set before placing in the paper cases.